Who doesn't like a free book? Thanks to The Hachette Group I've got 3 copies of The Cradle by Patrick Somerville to giveaway! What do you have to do to be entered? It's easy here at The Sweet Bookshelf! US & Canada ONLY. Sorry my International lovelies, Publisher's made the rules. In the summer of 1997, a newlywed couple, Matt and Marissa, are living in Wisconsin and expecting their first child. 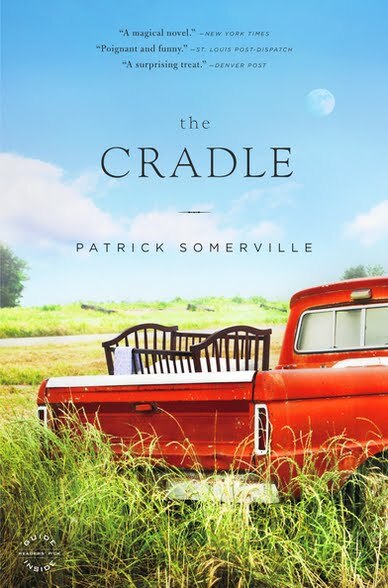 With the baby almost due, Marissa sends Matt on a quest to recover an antique cradle from her mother, who claimed it when she abandoned her family years earlier. Ten years later, a middle-aged couple, Bill and Renee, are living outside Chicago and preparing to see their only son, Adam, off to war in Iraq. Adam's departure brings to the surface deeply personal memories of Renee's first love, and forces the confession of a long-held secret that brings the two stories together in the novel's powerful climax.